Why Yoga for Cancer Patients? Here’s a great article from Cure publication regarding cancer therapy and yoga therapy. We provided the link below. Jean Di Carlo-Wagner, M.A., yoga therapist is a year colorectal cancer survivor (2003). She used yoga to help herself regain a ‘new normal’ and then became a yoga teacher to help other survivors. Her work is free to cancer patients at YogaBeing.net. Jean attends cancer conferences and speaks on the benefits of yoga for cancer survivors. Survivor, advocate, activist, teacher and friend. Following cancer treatment, I wanted to regain some strength and stamina. Where would I start? Talk about this article with other patients, caregivers, and advocates in the Colorectal CURE discussion group. Why yoga? And what is yoga? People often ask me these two questions. Why, as a yoga teacher, a cancer survivor, and advocate, would I practice and spend my time learning about and teaching yoga. After cancer, I wanted no only to regain some strength and stamina, but I wanted to have a subject to explore that would keep me interested for however long I was going to live. 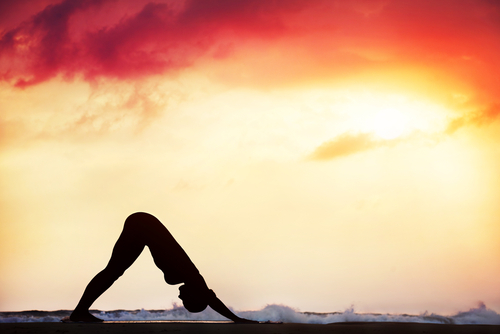 Yoga is such a vast topic, it would take lifetimes to explore all of it. That appealed to me. It was an inexhaustible source of learning. I had been a yoga practitioner since the age of 28, when a therapist told me that yoga would help me deal with my anxiety. She was right. I practiced many form of yoga over the next twenty years. It was always a part of my weekly exercise. After a yoga class, I felt not only physically better, but I somehow felt emotionally lighter and mentally more focused. I hadn’t given it much thought, but it just felt good. So when I was deciding what to do with the rest of my life; yoga bubbled up to the surface of my interest. I spent many hours with a therapist for chronically ill patients reconstructing my new life. Yoga would take center stage. If you’ve never practiced yoga or if you’ve had a bad experience in a yoga class, you may feel ambivalent about the topic of yoga. I’d like to invite you to engage in some yoga right now. Just the two of us. No one need know that you’re ‘doing yoga’. As you read this sentence, shift your awareness to your breath. You needn’t change your breath. Just notice it. What a pleasure to exhale and to release. How natural to breathe in without any hard effort. Keep noticing your breathing pattern. We’ve now done the most essential practice within yoga: breathing awareness. It’s just that simple. Yes, it is. When we bring our attention to our breath, our minds shift from the autonomic nervous system to the parasympathetic nervous system. We are engaged in calming and restoring our entire nervous system. The power of breathing, called pranayama in yoga, has been tested and researched over the last 50 years. Most recently, western terminology would say diaphragmatic breathing and the studies abound in its riches for health and well-being. You mean all I have to do is follow my breath and I’m doing yoga? Well, I’d say, yes. As long as you are breathing, there is some form of yoga that you can do and gain benefit. The foundation of yoga is breathing. There are many types of exercises and advanced forms of pranayama, yet, the safest and most beneficial for cancer patients is continous and focused inhaling and exhaling. Another word for inhale is to inspire. It literally means to “bring spirit in.” Yoga is a mind, body, spirit activity. We will reap the rewards of paying attention to our breaths and elongating inhalations and exhalations, but there are also lovely teachings that enhance the yoga experience. The teachings are universal and are found within all major religions. When we face cancer, we face our mortality, and most of us have questions about our spirits. Yoga is an ancient wisdom tradition. For today, the most important piece of yoga practice is noticing our breathing. Let it inform us about how we are feeling. Follow your breath when it comes in and picks us moisture and goes into our lungs. Watch your belly rise and watch it fall. With gentle attention and direction, we can use our mental focus to keep our breath steady. A steady breath will dictate a sense of calm to our bodies. But as I said, yoga is a universe of information. Still, the foundation of yoga is breathing. And we can all breathe. We are charmed to watch a baby breathe. We get mesmerized by the beauty of the whole body breathing in an infant. Take that image into your breathing. You are unique among the universe. No one is or ever has been exactly made like you. No one else has your breathing pattern. I’d love to know your responses to this simple beginning exercise. And for you advanced yoga practitioners, remember, that beginner’s mind is prized for its purity. Tell us about your beginning practice.